Prior to a few weeks ago, I had never heard of or seen Magformers. As I was posting a preview of this upcoming review on my Instagram account and FB page I felt like I had been living under a rock. Ha. So many of my friends and followers commented on how great Magformers are, and how much fun their families have with them. Meanwhile, here I was for the first time, building and discovering all the fun and educational perks Magformers have to offer. Building with magnets was always something I loved to do as a child. Now that I have children of my own, they too have fun building and experimenting with them. 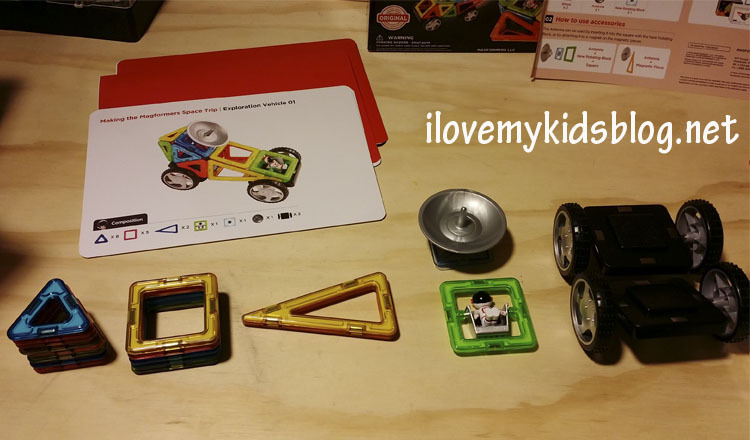 Magformers takes that excitement children experience playing with magnets and uniquely designs countless learning and playing possibilities within one set. Had I known the educational value and fun factor these have, I would have been buying them years ago. 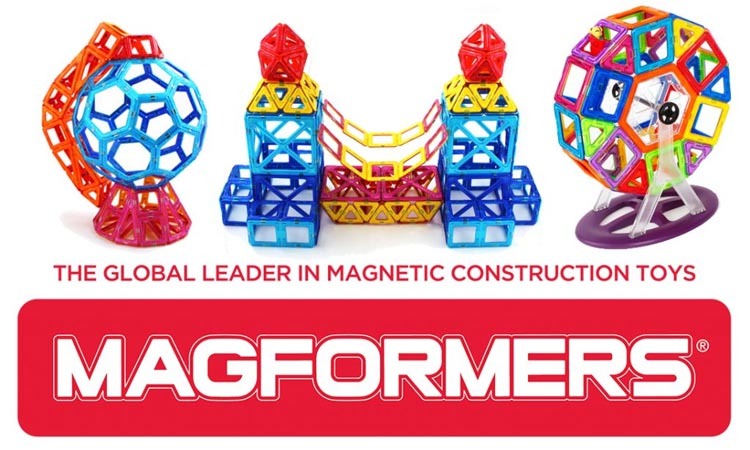 Turns out, after doing a little reading and research on their website, Magformers magnetic design is patented to provide the safest playing experience for children. Their products are built to withstand high playing and to have longevity. After playing with them, I really feel like these toys will last through years and years of building and playing. This set is a good one for beginner builders. The designs are simple to follow and very engaging. 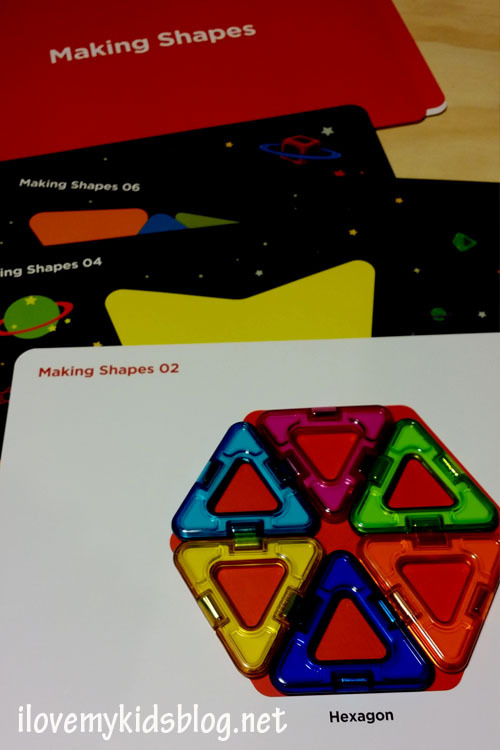 Inside the Space Wow set you will find 22 geometric shapes, 16 activity cards, and a step-by-step Idea Booklet. 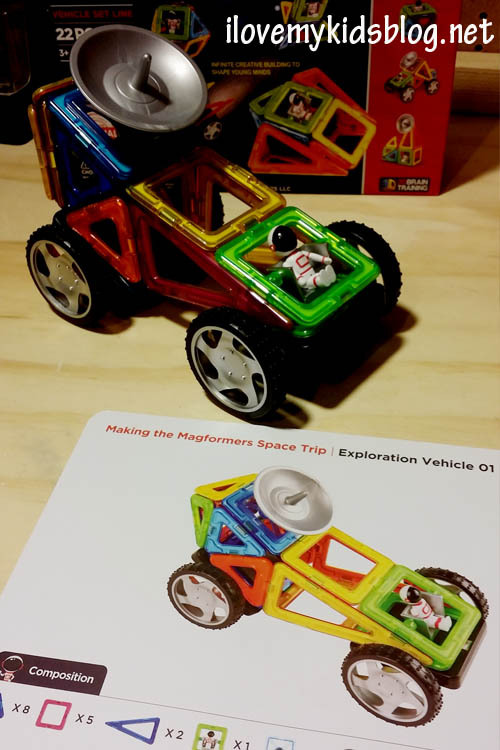 The step-by-step idea booklet is a great way to become familiar with the Magformers and their building capabilities. Following these building guidelines young builders can create 3D octahedron, pyramids, mini planets, and other amazing space objects. The activity cards are a lot of fun, and have a great educational factor to them as well. Young builders will be challenged as they use multiple pieces to create large geometric shapes. 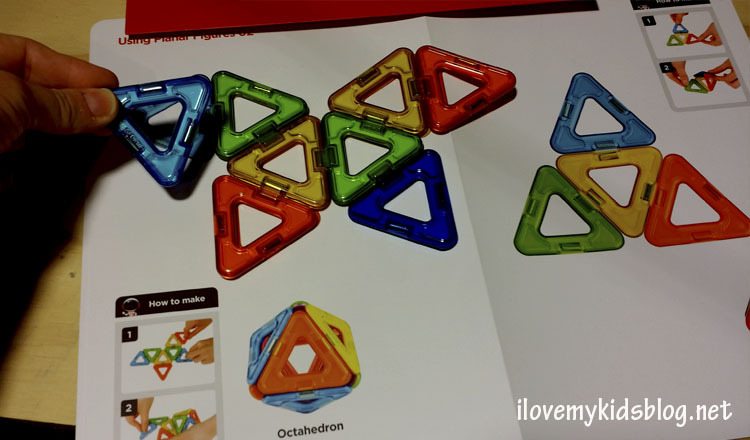 This helps with shape recognition and logical thinking as well. The skilled builder will be put to the test using some of the more complex activity cards to erect spaceships, exploration vehicles, and so much more. Every Magformers kit is compatible with each other. So the more kits you purchase, the greater the building potential. 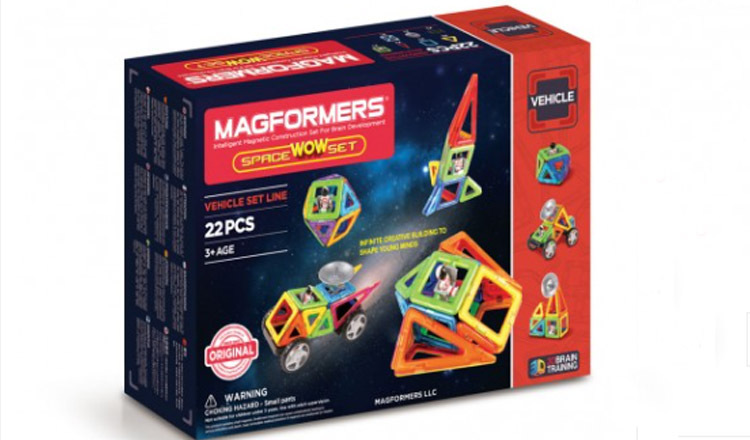 Many people I have spoken to this past week about Magformers have raved about how great of a product they are, but how the price to purchase them is ridiculously high. Although the price for these does seem steep to some, I feel that you get what you pay for with these sets. Not only will you get years and years of playtime with these, but they are safe for children 3 years and older. Knowing the quality of the product and realizing that they wont break after a year of frequent playing makes the price worth it. Do you agree with that? I would love to hear your experiences with them. Leave a comment below with your thoughts. 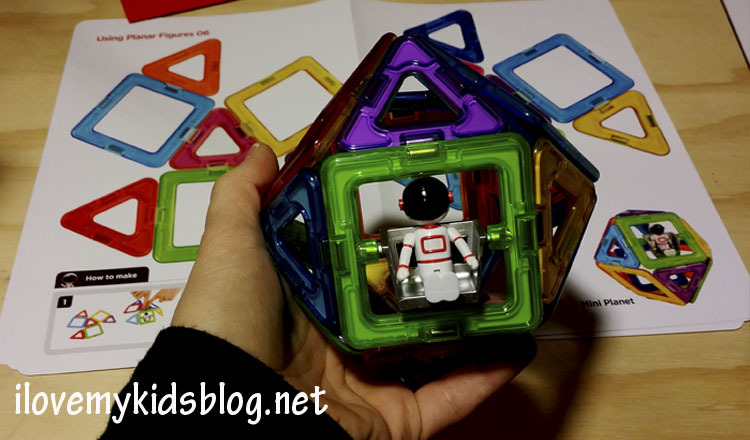 Magformers provided me with this item to review. Regardless of our arrangement, the words expressed are my own. Thanks!